Today, being a nice day before the polar vortex arrives midweek (or not), I went down to Baltimore for some cemetery exploring. 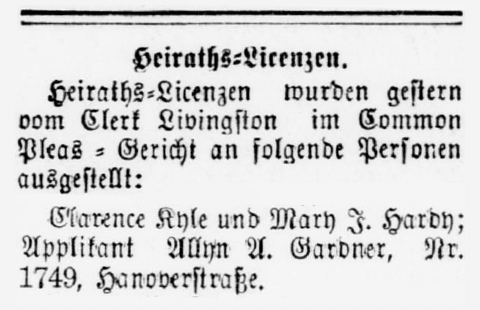 On Monday, I found a reference to my great-grandfather Allyn Gardner in a defunct Baltimore daily German language newspaper. According to a one-line note, he was the witness to a marriage license issued to Clarence Kyle and Mary Hardy. My great-great-grandmother Susan’s first husband was a Hardy (Henry Hardy probably died around 1868 as Susan married my great-great-grandfather William Gardner on December 22, 1869), and while I’ve been able to track one of her two Hardy sons (Thomas), I have been unable to track the other (Henry). In trying to figure out who Mary Hardy was and perhaps why my great-grandfather was the witness to her wedding, I’ve found some circumstantial evidence that her father, Henry Hardy, could be the Henry Hardy that is my great-grandfather’s half-brother. 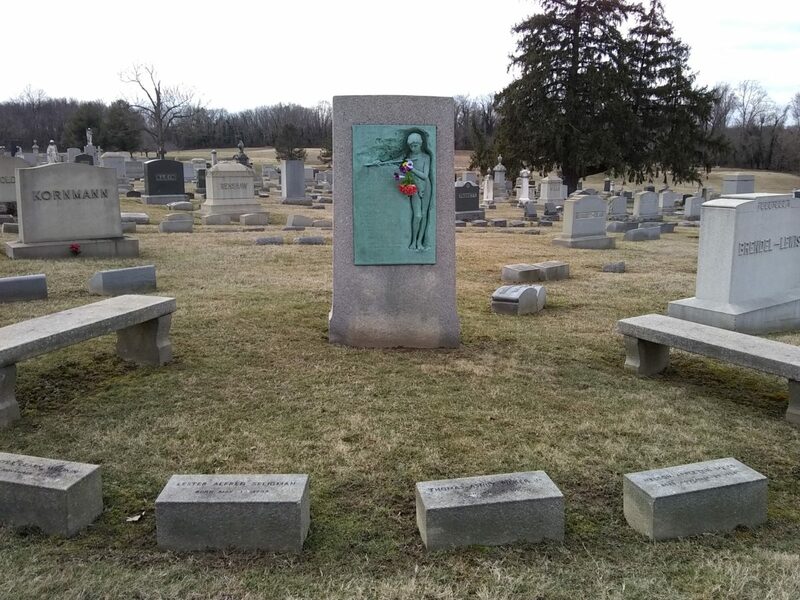 I discovered that Mary and her husband Clarence were buried in Loudon Park Cemetery’s M section, which is adjacent to the cemetery’s Whatcoat section, where my great-great-grandmother Susan is buried along with several others, including her daughter Isabelle. Armed with maps and a notebook, I went to take a look. Henry’s stone is interesting. I’ve seen these all over, and I call them a “railroad tie” style. It’s a ground-level stone that seems to be squarish and long onto which the name is chiseled into one of the corner edges. I had to clean it off; there was wet grass clumps “glued” to the stone and across the name. You can see there are places on the stone that are dark brown, especially at left. Those were grass clumps. 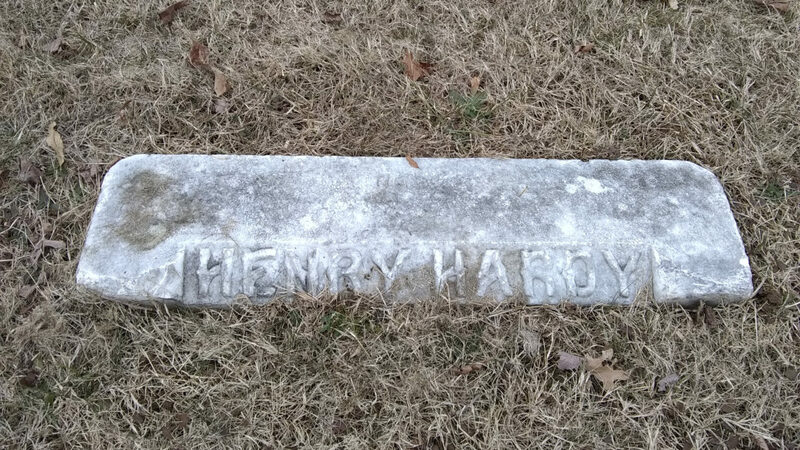 I was really impressed with the chiseling of the name “Henry Hardy” on the stone. There’s an interesting, early 20th-century style to it. Frankly, the shapes of the letters reminded me of the “B” logo of the Boston Red Sox and the Brooklyn Dodgers. This is the grave of Henry Hardy, his wife Helen, and his sons Thomas and John. Helen Ruth Hatton Hardy died in 1931, and her husband Henry in 1937. The Henry Hardy here was born in early 1865. My great-grandfather’s half-brother Henry was born in 1865. The Henry Hardy here married Helen in Washington, DC in October 1882; he was seventeen, she was sixteen. Their daughter, Mary, whose wedding my great-grandfather Allyn witnessed, was born ten months later, in August 1883. Henry and Helen also had two sons, Thomas and John. Both died shortly after their twenty-first birthday. From a 21st-century perspective, pre-World War I mortality is staggering. About thirty feet from Henry and Helen Hardy is their daughter Mary and her husband Clarence. This site was an interesting combination of two different memorial styles — there’s the original “railroad tie,” and then a more modern headstone was added by a later generation (the back of the headstone is for Mary and Clarence’s grandchildren). 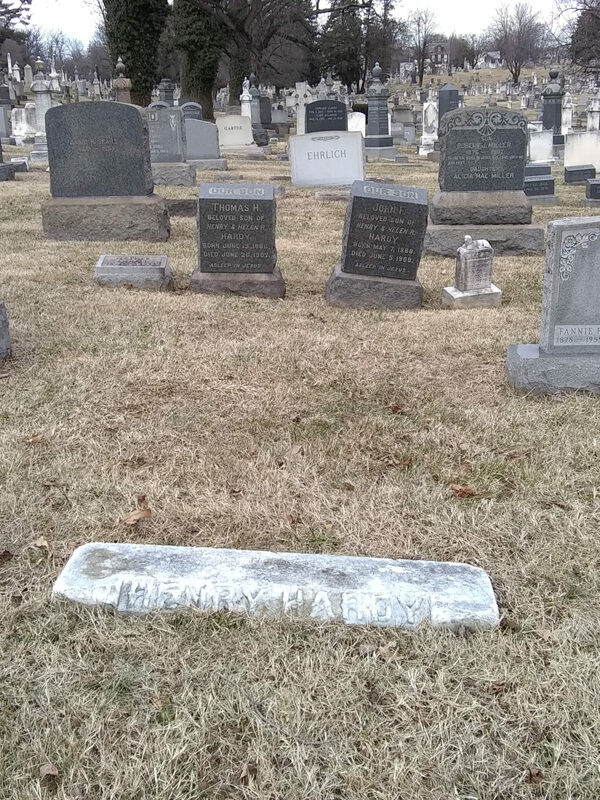 Henry Hardy’s grave, sadly, provided no evidence as to whether or not he’s a relative. I have more research ahead. As Indiana Jones reminds us, 90% of archaeology (and that’s what genealogy is) happens in the library. Or today’s equivalent, the Googles. 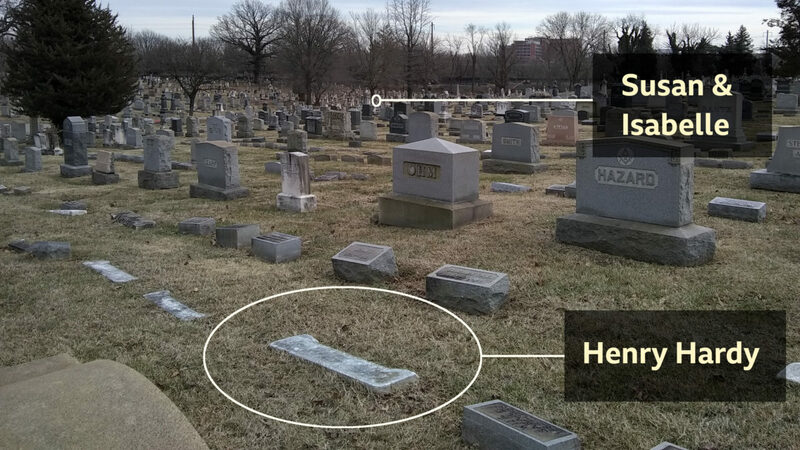 It is possible to see where my great-great-grandmother Susan is buried from Henry Hardy’s site. In summertime it might be difficult — the trees will have budded — but today, I could make out the Boswell monument quite easily. (Easier on the ground than in my photos, to be honest.) I could not make out the headstone for Arthur Gardner, my great-grandfather’s brother, on the hill overlooking his mother, however. I know it’s there, but I couldn’t see it. For one thing, it’s small. For another, there are trees in the way. Henry’s marker, obviously, would not be visible from my great-great-grandmother’s grave. I couldn’t even identify the rough location when I looked back in Henry’s direction. I left flowers at my great-great-grandmother’s grave. It’s silly — they’re going to freeze this week — but it was still important to me. It adds a spot of color, and the American flag I left at Veterans Day was still there. I also did some cleanup of the site; there were indications that the area had flooded recently, and there was a lake of pooled runoff water at the bottom of the hill. I have seen it far worse. It’s very wet and muddy down there. I also checked in on my great-grandparents, who are fine, but I was more interested in the abandoned train tracks near them. 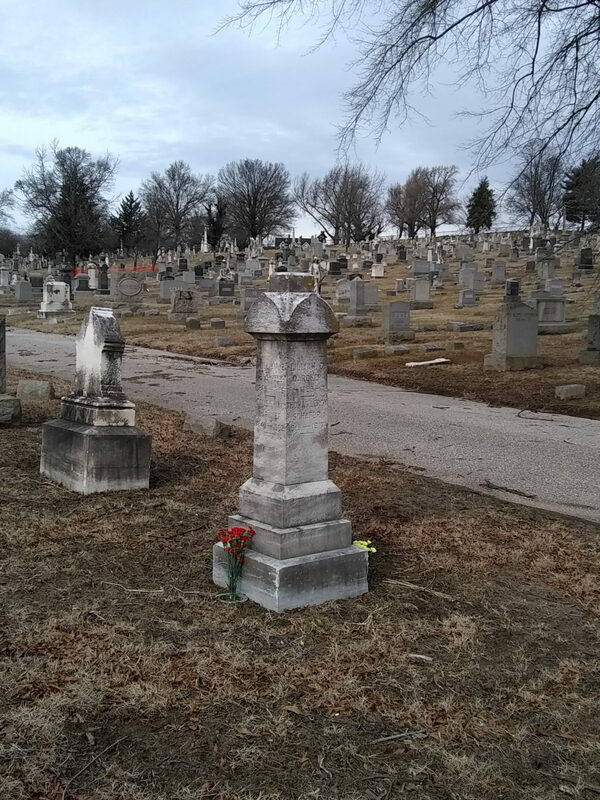 There were two trolley lines through the cemetery in the early 20th-century. Coffins would be brought to the cemetery by train, and then they would be loaded onto the cemetery’s trolley system and conveyed to near their final destination. 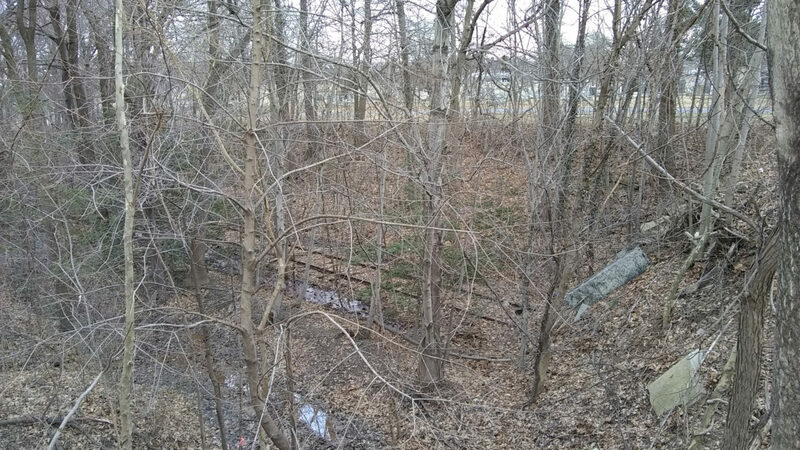 One of the trolley lines went past the section of the cemetery where my great-grandparents are buried; you walk over to the edge of the woods and there, down in a ravine, are all that’s left of the trolley system, some abandoned tracks. 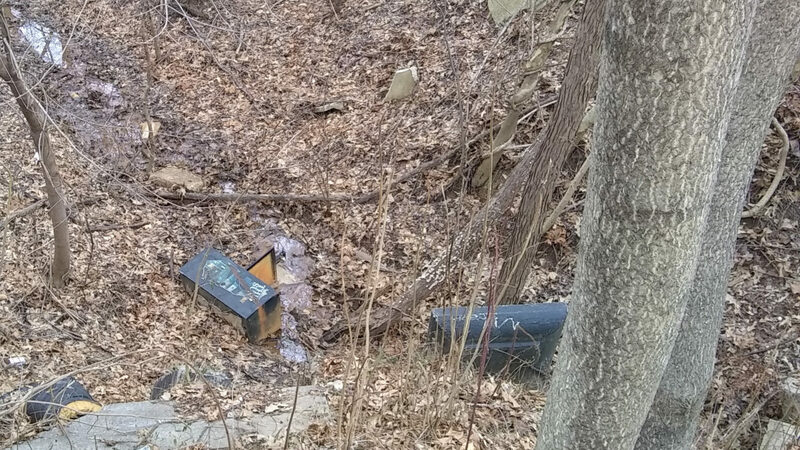 There is also, for some reason, a Baltimore Sun newspaper box discarded in that ravine, as well as some other things I could not identify. The plan ahead is to do more research. If the Henry Hardy I visited today is, in fact, my great-grandfather’s half-brother, then I have located and visited nine of his ten siblings that I know of. 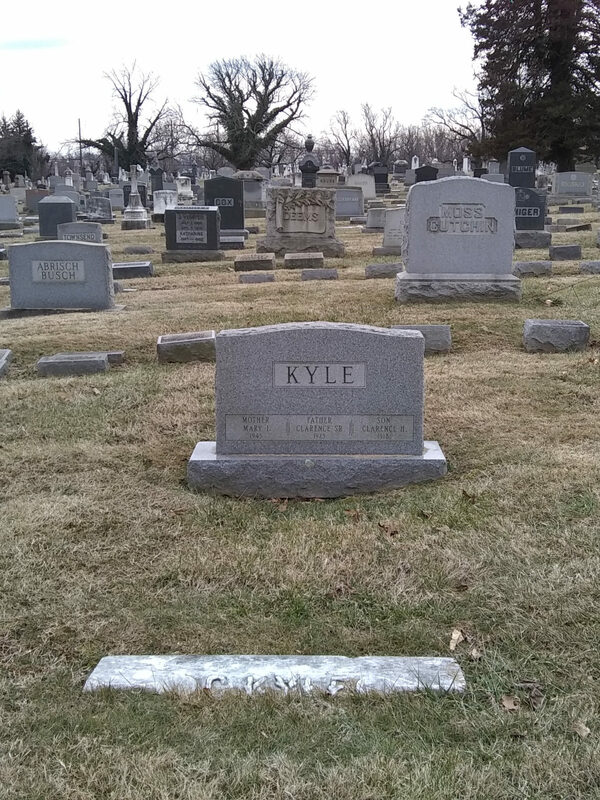 (Based on gaps in ages, William Gardner, my great-great-grandfather, and his first wife Mary could have had two children who didn’t survive infancy, but if they did I have no idea what their names were or where they are.) The tenth is William Gardner, Jr., whose fate I simply don’t know, though I suspect he died around 1887 as that’s when he seems to vanish from the records. All in all, it was a nice outing, and it turned out to be warmer than I expected. Let’s hope that deep freeze stays away. 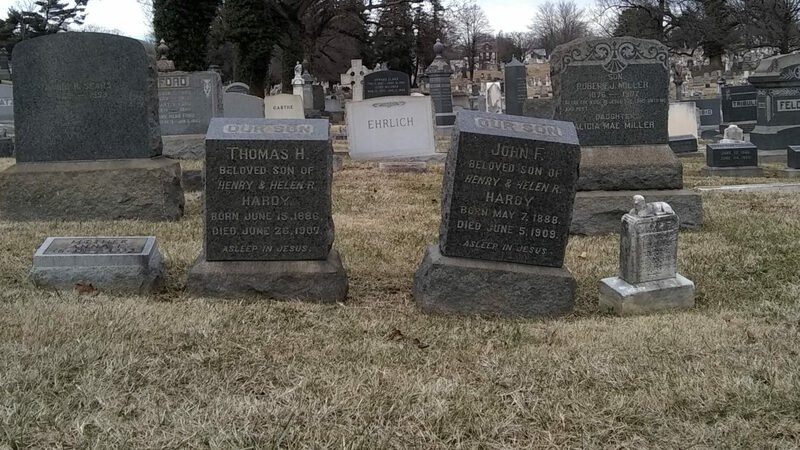 The Helen Ruth Hatton Hardy and Henry Hardy are my great- great- grandparents. Their Daughter, Mary Irene Hardy married Clarence Kyle who gave birth to Catherine Irene Kyle who married James Robert Bathurst Skelton who gave birth to Catherine Ann Skelton, my mother. Catherine and James Skelton are also buried in Louden Park Cemetery.